The space gray mid 2017 Apple 13.3" MacBook Pro is faster and more powerful, yet thin at 0.59" and lightweight at just 3 lb. This system is powered by a 7th Gen Kaby Lake 2.3 GHz Intel Core i5 dual-core processor that features a burst speed of up to 3.6 GHz, while 8GB of 1866 MHz LPDDR3 RAM helps to ensure smooth multitasking and also allows the computer to quickly access frequently-used files and programs. Buy this MacBook Pro 13.3" with bi-weekly payments. For long-term storage of your files, this MacBook Pro 13.3" is equipped with a 128GB PCIe SSD, with sequential read speeds up to 3.1 GB/s and sequential write speeds up to 2.1 GB/s. If you want to add external peripherals, dual Thunderbolt 3 ports support bi-directional transfer speeds of up to 40 Gb/s, while also supporting 10 Gb/s USB 3.1 and device charging. 802.11ac dual-band Wi-Fi is built-in for wireless networking, and Bluetooth 4.2 technology will also allow you to connect additional compatible peripherals. Other integrated features include a 720p webcam, dual microphones, stereo speakers, a 78-key backlit keyboard with 12 function keys and four arrow keys, an ambient light sensor, and a larger Force Touch trackpad. 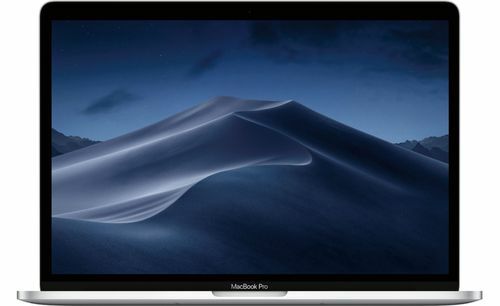 The MacBook Pro 13.3" includes a 61W USB Type-C power adapter that operates using 100-240 VAC at 50-60 Hz, a 6.6' USB Type-C charging cable, and a built-in 54.5Wh lithium-ion polymer battery that lasts for up to 10 hours before recharging is required - or up to 30 days of standby time. macOS Sierra is the installed operating system. Interacting with the MacBook Pro 13.3" is a better experience all around. The keyboard has been redesigned to include a second-generation butterfly mechanism, which has been refined for greater comfort and responsiveness. The Force Touch trackpad is also much larger, giving your fingers more room to gesture and click. Thunderbolt 3 is a hardware interface that utilizes the reversible USB Type-C connector. Doubling the speed of its predecessor, Thunderbolt 3 features a maximum throughput of 40 Gb/s when used with compatible devices. The connector also transmits data via USB 3.1 at up to 10 Gb/s, and dual-bandwidth DisplayPort 1.2 allows you to connect up to two 4K displays simultaneously or one multi-panel 5K display. The MacBook Pro 13.3" has two ports, sharing one dedicated bus.